The details for this motorcycle were found in a listing on Brightwells website who are a Auctioneers / Valuers of Leomister. The below is the information listed on the auction site and as we find more we wil ladd it to help preserve the record of this great Sporting Motorcycle which spent most of its competitive life in Wales. BSA commenced their Empire Star 350cc range of machines for the 1936 season. By 1937 the machine was available in three guises, the B24 Empire Star, the B26 Sports and the B25 Competition, as here, which differed from the other models being primarily designed for trials with competition tyres and mudguards, a high level exhaust pipe and a larger front wheel for added ground clearance. These models began the sporting tradition that later led to the Goldstar range which was implemented for the 500cc in the 1938 season, although in 350cc form the Empire Star range continued until 1939. This particular machine was despatched from BSA on 2nd November 1937 to dealers R Bevan of Cardiff, for supply to Percy G Sivell for use in trials and ISDT events – Sivell having been the 1936 Welsh trials champion riding a 350cc New Imperial. Copies of factory records show it returning to the factory in June 1938 and February 1939 for modifications and repair. Part of the Swansea club team with N Treseder and EG Bennett, Sivell entered the bike in the 1938 Welsh ISDT. This proved to be a particularly tough event, with only 82 of the 209 entries making it to the finish – Sivell (rider 183), becoming one of the retirements on day two. However, he was more successful at Pendine, winning the 350cc standard class on this machine. The bike was later purchased from the Sivell family by two young lads who rode it around the fields in the 1960s (it being a testament to the machine’s build quality that it survived this!). It then laid unused for a number of years, coming into the current vendor’s possession in 2002. After fitting new tyres and tubes, a new wiring harness and a rebuild of the magneto and dynamo it was returned to road use later that year and was in regular use until 2006.Although it has not been ridden since it is said to start and run well. 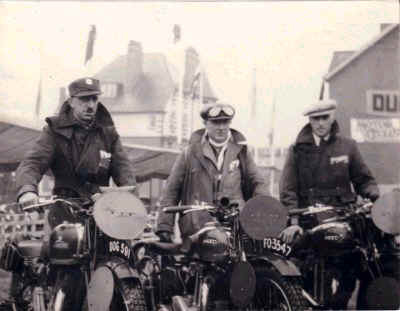 Documents with the bike include a V5C, Goldstar Owners’ Club dating certificate, sundry old MOTs, copies of sales/spec sheets, copies of 1938 Welsh ISDT reports, copies of factory repair records, a photo of Percy Sivell and correspondence confirming the machine’s provenance. BSA Empire Star is cool as it is. An Empire Star scrambler is so cool it is beyond comprehension. It is testament to the build quality that this bike still exists today, that it is able to start and run well.